On the whole, football is a ridiculously dramatic sport. Fans have been known to riot, fight with one another and hurl missiles from the stands. Players like to feign injury, cry obsessively when things don’t go their way and kiss each other after they score goals. And announcers and pundits like to spin nothingness into headlines, distort the truth, and say whatever they can to drive up their ratings. there’s loads of controversy in the english game, but when you look at it collectively, a bigger problem starts to take shape. So when controversy rears its head within the game — honestly, nearly a weekly occurrence of late — I always try to take it with a grain of salt. Everything is made out to be a big deal in soccer, so there’s not really a need to get all riled up over nothing. In two week’s time the latest embroilment will have wiped the one I just made a fuss about from everyone’s memory anyway. But when taking a larger look at all the controversies within the English game over the last few years as a collective, you can start to see a larger picture begin to take shape. Take for instance the recent cries from around the Premier League about the performances from some of their referees. Blatant dives are sometimes rewarded with free kicks, while other times they go uncalled and unpunished. Players are mistakenly shown red cards for relatively tame challenges, while others players don’t receive them when they should. In one manager’s opinion too little injury time was added, while to the other it seems as if the ref has just forgotten to blow the whistle. Now, I get that referees are going to miss things from time to time. There human just like you and me: imperfect and flawed. And they have the hardest job in football, having to make decisions in just a fraction of a second. But the problem is there’s to be absolutely no complaining about it. There’s no room to question the lack of consistency between one referee’s showings in subsequent matches, let alone the differences between each referee’s interpretation of the laws of the game. You can’t question the referees decisions, nor can anyone retroactively punish players for sins gone unnoticed. Do so and face the heavy hand of the FA, with fines and match bans to follow. Even worse, there’s virtually no transparency in how the refs are evaluated, judged or punished. Players and managers are made to answer for their actions, but the referees sure as hell aren’t. While I don’t necessarily agree with the speculation all the time, this does leave ample room for somewhat justifiable conspiracy theories to develop about perceived corruption among those running the game from lofty thrones. 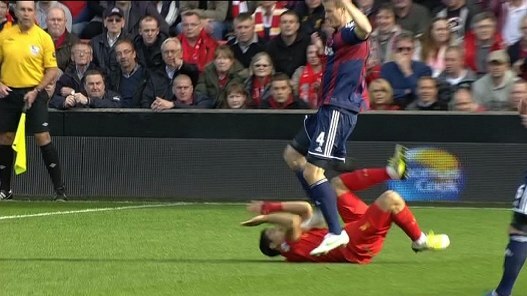 the man in the top left of this picture is looking directly at robert huth, yet nothing came of his stamp on suárez. no punishment for the referees in question, no retroactive ban for huth. The recent uproar over diving as of late is another way to see the bigger problem take shape, too. Luis Suárez — quite possibly the man who defines serial diving — has been martyred in the press for his simulations. He’s rarely ever awarded calls due to this perception, and deservedly so. But other players playing in England, such as Gareth Bale or Ashley Young, are not treated with near as much contempt as their non-British counterparts. It’s only really become a “problem” for the authorities now that so many foreigners — Suárez, Hazard, Torres, etc. — are tainting the supposedly pure pitches around the English game with such despicable forms of manipulation. Never mind the fact that current England captain Steven Gerrard, has been known to flop for the better part of a decade. Yet even with this “epidemic” sweeping across their leagues, the FA have stood motionless on finding a solution other than wagging their fingers disapprovingly from their ivory towers. Which seems ridiculous, considering there’s a perfectly viable solution to help them halt diving that they apparently want no part of: retroactive punishment. Leagues such as Serie A and MLS have used it to punish players whose dives have gone unnoticed, to great effect. However, the FA find issue with the practice because a) they would then have to admit that their referees can sometimes get things wrong on the pitch, and b) it goes “against the traditions of the game” to use technology. The horrors, right? And, surprise surprise, the biggest controversy of the last year in English football, also points to this increasingly evident conclusion. The racism accusations waged against Luis Suárez and John Terry were handled so inconsistently — Suárez given an 8-match ban and Terry a 4-match ban with a sizable fine — you have to wonder how the FA managed to justify the discrepancy to themselves. Not even arguing the matter of who actually deserved their bans (Terry did, especially considering his conspiring with Ashley Cole to cover it all up. Suárez has more of an excuse, though not acceptable by any stretch either. ), it’s inexcusable to see two players receive such vastly different bans for what could easily be considered two very similar incidents. FA chairman david bernstein isn’t exactly greasing the wheels of progress in the english game. In all of these cases, the inability for the current footballing leadership in England to handle all of the issues plaguing their game is pathetically embarrassing. They allow themselves to be bullied by certain clubs, managers and players. They ignore proven solutions to problems that the public demands action on, showing a glaring weakness in adaptability in a rapidly changing world. And they operate in such an opaque manner that it doesn’t feel like a stretch at all to make audacious accusations of corruption and cronyism when you look at the growing pile of evidence that indicates as much. Why does it seem to take such a monumental wave of negative public opinion to really enact any sort of change at all in the current footballing set up? Because those that are in control don’t care to change a system that is working for them? Maybe. We don’t know because they don’t really give us an answer why. But whatever their reason, it’s not good enough any longer. Put simply, the current leadership isn’t fit to handle the modern game of football. A revolution is needed in England, much like the one needed at FIFA: a “house cleaning”, a heavy dosage of “out with the old and in with the new”, a “fresh start”… whatever you want to call it. A leadership group is needed that’s capable of running the game fairly and consistently, without outside influence, and with a degree of transparency where the players, media and fans aren’t left to wonder why and how the inevitable controversies are handled. I don’t think that’s a lot to ask for, and rather it’s something that we the fans — the people who buy the tickets, tv subscriptions and replica shirts that fill their gargantuan-sized piggy banks with mountains of cash — deserve. Yet it’s something that the current leadership at the FA and the Premier League care very little to address. Given the FA’s considerable sway in IFAB, the committee responsible for changes to the laws of the game, the lack of action within their own leagues is very concerning. Until the day that house cleaning takes place, or barring a divine miracle that alters the path currently being taken by chiefs of the game, we should all continue to expect the game’s biggest problems to take a really, really long time to be fixed.